Apostolic Titbits: Do You Pray And Sing With Both Your Spirit And Understanding? Do You Pray And Sing With Both Your Spirit And Understanding? "14 For if I pray in a tongue, my spirit prays, but my understanding is unfruitful. 15 What is the conclusion then? 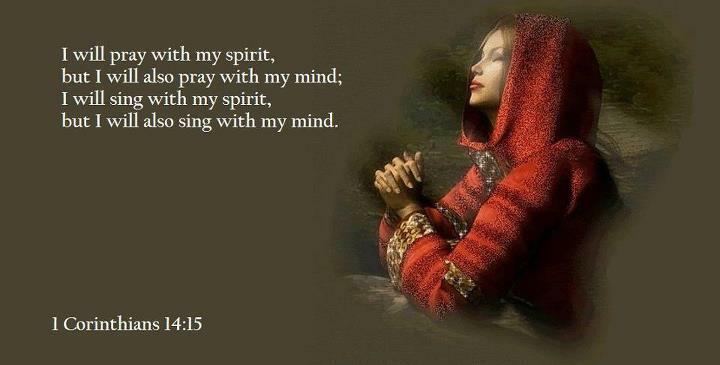 I will pray with the spirit, and I will also pray with the understanding. I will sing with the spirit, and I will also sing with the understanding." (1 Cor 14:14-15). The very reason Jesus came to His people is to baptize them with the Spirit and of fire from heaven. This fire was revealed to the whole world on the day of Pentecost when those who were filled with the Spirit of God began to speak in tongues. There is not even a small clue found in the Bible about the fire of tongues withdrawn from the Church. God is pouring out more and more of His Spirit and His fire on all those who are seeking for it sincerely. This fire of God will tame the tongue of every person who is born in God and have received the Baptism of the Holy Spirit. Nothing other than this fire of heaven has the ability to control our tongue. This supernatural fire of tongues also have the ability to cleanse us and bring out a pure prayer and worship of sacrifice which is acceptable in the sight of our Father God and our Lord and Savior Jesus Christ. The purest prayer of faith is praying in tongues personally to the Lord and the purest form of worship is to sing in the spirit to the Lord. When we are doing both, we are giving thanks well. But at the same time we need to pray and sing with the language in which others understand when we are in public group prayer and worship. So do both, but do not neglect the other. Every one is supplied with the gift of tongues when they are filled with the Spirit of God, because God knows that the only way intimacy can be established with His children is when they start to move supernaturally natural through the prayer of faith which is prayed in tongues. If you are baptized in the Holy Spirit, praise the Lord for it and keep praying in tongues in your personal worship to the Lord daily. If you have not yet received the Baptism in the Holy Spirit, then sincerely seek for it and expect the Lord to give you. The fire of tongues is the external evidence of the internal filling of the Holy Spirit, so watch whether you are getting the utterance of the Holy Spirit within you and start to move you mouth and speak what He gives to you within. When the fire touches you, you cannot but see the difference it brings in your spiritual life to be a witness to Jesus in all the world. Praise be to God for all His benevolent gifts and benefits that He has freely given to us in Christ Jesus. If we do not value this great gift of the Holy Spirit with the externals evidence of speaking in tongues, we will never receive it for a millions years because it is too precious for the Lord to waste it on those who do not seek for it. May the Lord fill those who are still lacking this anointing, and those who have it, may the Lord help them to be quickened in such a way that they may become an house of prayer for all nations and pray without ceasing for the glory of God.